There is no such thing as a “one size fits all” diet prescription. EveryBODY and every DAY is different, and the way you choose to fuel your body on a daily basis should reflect that uniqueness. 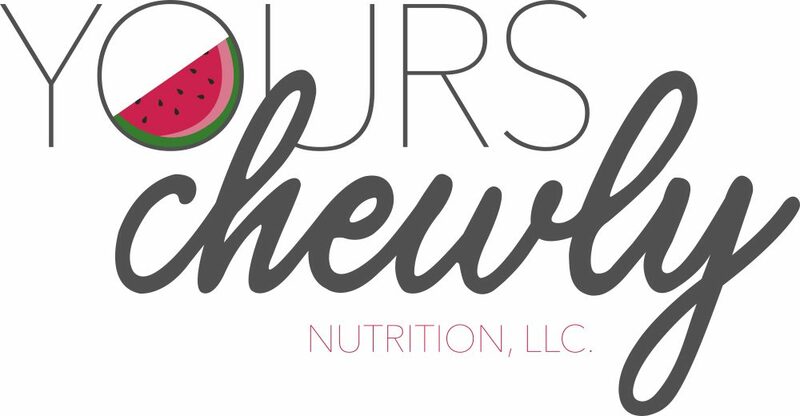 A chewly “healthy” diet looks different for everyone, but at its core, includes balance, freedom, autonomy & enjoyment. Food is not meant to control your life. Rather, it is meant to fuel your ability to grow towards the best-feeling, most loving and confident version of yourself. As an gentle nutrition-focused Registered Dietitian, I help people like YOU find a sense of true happiness & confidence in health by helping you to create a positive and free relationship with food. I help people like you “ditch the diet” once & for all by Eating Gently, Moving Freely, & Loving Fiercely. Practice with these concepts position you for lasting success with healthy eating that’s both fun, tasty & fitting for your unique lifestyle. I work one-on-one with individuals to provide personalized gentle nutrition coaching. My collaborative approach is rooted in practices of mindful & intuitive eating that work to establish a fundamental knowledge of nutrition, understanding of + appreciation for your own body & foster sustainable healthy eating + mindset patterns that will last a lifetime. What makes online private coaching with me different from other coaching programs? Unlike other coaches, I work beyond calorie & macronutrient tracking because I believe that food is much more than a number–it is the source of your fundamental wellbeing. With me, no foods are “off limits.” Your internal voice, unique cravings, hunger, and satiety cues dictate what foods are best for you. I will help & support you in finding and honoring that voice. Unlike other coaches, I will never provide you with cookie-cutter, calorie-restricted meal plans. I will honor you as a whole, dynamic individual, showing you ways in which healthy, free, intuitive living can fit into your daily life. Unlike other coaches, I have years of personal & practical experience in plant-based eating patterns. Whether your goal is to transition to a plant-based living or simply to include more plant-based foods in your daily meals & snacks, I can help you do so safely and effectively. Unlike other coaches who may lack certified education and practice in the science of nutrition, I have formal training and experience as a Registered Dietitian Nutritionist. I value your health and safety, and will never give you information that is not backed by research. Unlike other coaches, my number one goal is to help you fall in love with YOU. I’m here as your guide and partner in the discovery of your innate power, uniqueness, and ability to transform into the healthiest, happiest version of yourself. If you’re tired of dieting without seeing long-term results, tired of feeling like you need to cut out foods you love in order to achieve your goals, or wondering what a more gentle, intuitive approach to eating can do to revamp your relationship with food, click the button below to fill out a private coaching application. Please only fill out this application if you are serious about working with me to make a change & invest in the best version of yourself. I choose to be selective in who I work with because I want to build the best, most effective & supportive relationships with my clients. Once I review your application, I’ll reach out using the provided contact information to schedule a FREE strategy call. If we decide you’re a good fit for my coaching services, you’ll secure a spot in my private coaching program!